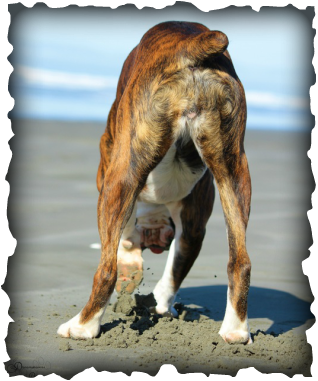 Boxer JKD is a condition seen in Boxers, leading to chronic renal failure, due to the structural changes to the dog’s kidney, the dogs kidney did not develop properly. There is strong evidence to suggest that this is an inherited condition in Boxers, as this condition has been found in closely related family members. If your Boxer has any of the symptoms listed for a prolonged time, or has a sibling diagnosed with Boxer JKD it is advisable to consult your veterinarian for a diagnostic 'work up'. Early symptoms are usually subtle and unspecific making the disease difficult to diagnose, even for vets. For an asymptomatic sibling (Full Brother or Sister), screening tests may be all that is needed (read about screening tests here). For a Boxer with symptoms related to Boxer JKD/Chronic Kidney Disease (CKD) a more extensive 'work up' is needed. It is important to get an early diagnosis, as this will allow for treatment that will prolong the life expectancy and improve the quality of life for the dog. The diagnosis is based on the full History, clinical symptoms found during the exam as well as the results of the diagnostic tests. Diagnostic imaging should be performed to determine the kidneys shape, size and structure. If Boxer JKD is confirmed, further investigations will be required to determine the stage of renal failure, according to the IRIS guidelines. This will allow your vet to commence your dog on appropriate medications and diet. Please inform your breeder about the diagnosis, this is crucial information affecting their breeding program. Write down any medications your dog has been given, including flea preventatives and vaccines. Measure your Boxer's daily total water intake over a three day period (including moisture in food), skip this point if you don't have the time, but try to quantify the daily water intake. Make a note of where you have been traveling with your Boxer. Combinations of survey radiography, abdominal ultrasonography, serial clinical pathology tests, including urinalyses and urine cultures, and blood pressure measurements should be performed to evaluate the severity of disease, establish a prognosis, monitor the response to therapy, and identify complicating factors. Specific renal function tests and renal biopsy may be helpful to identify the exact cause in Stages 1–3, but the presence of advanced pathologic changes in Stage 4 is nonspecific and often precludes identification of an underlying cause by histologic studies. This condition in late Stage 4 is often described as end-stage renal failure clinically and as chronic, generalized nephritis pathologically. CKD should be distinguished from the more readily reversible acute disease. Frequently, differentiation may be accomplished with an appropriate history, physical examination, and laboratory findings, although a renal biopsy may be required. However, therapy for CKD caused by a range of morphologic lesions is similar, so renal biopsies may not be warranted unless marked proteinuria is present or a treatable cause is suspected.